I was at the teacher table, working with a small group. Glancing up, I tensed as I noticed Tommy, Sarah, and Tanisha arguing about who should have the first turn. A game of Rock, Paper, Scissors ensued to solve the disagreement. Congratulating myself on having taught such a valuable problem solving skill (*cough*), I refocused on my group. A few moments later, Tommy appeared at my table. He tearfully explained that he had been winning the Rock, Paper, Scissors best-of-three round, when Sarah changed the rules to "next-one-wins." I quickly UN-congratulated myself for not seeing that one coming, (sneaky little Sarah!) and then spent the next few minutes dealing with the Rock-Paper-Scissors conundrum. Due to the crisis, Tommy's group lost a good 8 minutes of work time. My teacher table group lost about 4 minutes of valuable intervention work. Sound familiar? Maybe you have these students in your class too. You may also have: excuse makers, wanderers, socialites, the bosses (Sarah), the I'm-too-good-to-work-with-him/her, the argument makers, the wallflowers (Tanisha), the criers (Tommy), and the refuse-to-work with anyone else students. Hopefully you've also got the all important: always-on-taskers, the peacemakers, the little teachers, and the rule-followers. 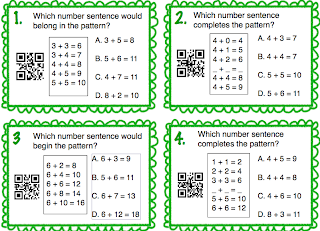 With such a range of personalities, how can you make math stations productive? Before looking at HOW to make productive stations, we need to define WHAT we want. First, how will our students be held accountable? As teachers, we need proof that our students were actually doing their work rather than visiting (or arguing) while we were engaged at the teacher table. Next, how do we ensure that all children participate? We don't want our rule-followers and little teachers doing all the work while our wanderers and socialites do their own thing. Finally, we need to know that students are practicing how to get the correct answers. That was my biggest fear; I was afraid students were practicing and reinforcing incorrect procedures. Once those pathways in the brain are reinforced, it can be difficult to undo! Let's look at solutions now. How do we know students are doing their work? I have tried station answer sheets and weekly station rubrics which were glued into their math journals. However, students often forgot to glue them in and/or fill them out (2nd graders). I want their grades to reflect their math ability rather than their gluing ability! Additionally, the students' station rubrics ended up taking valuable time, and both solutions wasted paper. I finally decided on what now seems such an obvious answer...have them write the answers directly in their journals (*facepalm* Why didn't I think of THAT first?). Students title the page with the station name and write the answers underneath. If the station is unfinished, then they can go back to the page to complete it next time they are at the station. Wouldn't it be nice if they were all able to take turns? If they could support, listen to, and coach each other with ease? Pipe dream? Nope... Kagan structure! Our district has been training us in Kagan structures, and I have to say I am sold. It compliments the valuable research and strategies I learned in the BrainSMART graduate program. Update: I've updated the structure listed on this post after a discussion with a Kagan representative. I discovered there is an even better structure for math stations, with more involvement! The structure we now use for our groups is called RallyCoach (Kagan, 2009). Students work in pairs. First, partner A solves, while partner B coaches. (Students need to be instructed that coaching means helping and guiding, not giving answers.) Once the problem is solved, partner B will give partner A praise and then the roles switch. Now partner B will solve, and partner A will coach. Each student is getting a turn to solve and coach. I have mentioned on this blog before what a powerful tool peer-coaching is. Students who teach each other will retain far more than students who work alone. The RallyCoach (Kagan, 2009) structure has this powerful brain-based component built in. For more information about Kagan please visit the website www.kaganonline.com. Now that we have the accountability and the participation pieces in place, we need to make sure the kids are practicing the correct procedures. I try to have an answer key at each station. Therefore, the “answer checker” is able to be sure of his or her response if a challenge is issued. Another, more fun way, is to use QR codes. After student 2 works out the answer, student 3 can use an itouch or ipad to check the corresponding answer embedded in the QR code. The app store has tons of free qr code readers. I like the one called Scan. Students love to check their answers with technology, so you’ve got instant engagement! Best of all, you can easily make your own qr codes. 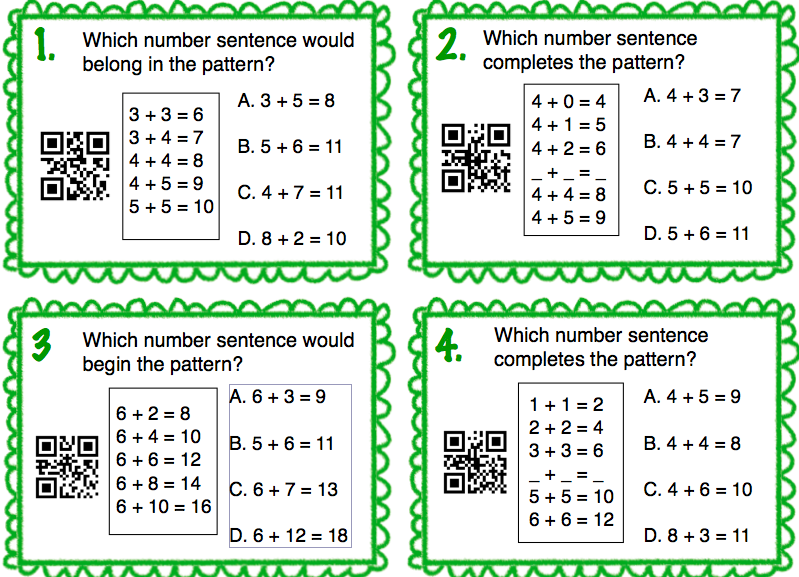 You can download this taskcard set free in my TPT store Number Sentence Task Cards for a closer look. Now I am comfortable at the teacher table because I know my kids are LEARNING! They are problem solving and determining the best way to get the correct answer. Are my stations perfect now? No. However, things have dramatically improved! Now I know my kids are all engaged, I have proof of their work, and I know they are practicing correct procedures. Plus, I won't have to deal with the whole Rock, Paper, Scissors issue because the student with the lowest class number always goes first! What procedures do you use in your classroom? Just wondering if it wouldn't be better if everyone worked on the problem rather than having just one child at a time be responsible for that? That way all of the children are engaged in the math rather than just one or two. Make sense or did I miaunserstand this structure? Hi, great question! Yes, ideally all the children should work on a problem. However, that's typically not what happens. Usually one or two do all the work. This structure ensures they are all involved. My name is Lindsey Estes. I am a student at The University of South Alabama in Mobile, Alabama. I am an elementary education major and in Dr. Strange's EDM 310 Course. In EDM 310 we learn about using different technology resources in our future classrooms. I have always enjoyed math as a student and through tutoring students, I have come to enjoy teaching math as well. I really enjoyed your blog posts about Math Station Groups. You shared some very helpful advice when creating any type of work station for classes to participate in. Through substitute teaching I have learned about many of the struggles you shared when assigning students group work and I have always been intrigued at how teachers successfully set up work stations for their students, while they worked with a few students as well. Using the QR codes for answers and rotating the roles the students have are both wonderful and useful ideas. I plan to use many of your ideas in my own classroom. Thank you for sharing your resources! Just out of curiosity have you tried this work station method with any other subjects for your class? I enjoyed reading your blog and exploring the resources you have shared. I have used that particular Kagan structure in science, social studies, and language arts. There are many others structures I use in all subjects, but this particular one works best with math stations. I have a student teacher right now named Lindsay! Diane, I do gifted pullout and used this structure today to review multiplication with my second graders! Great result! 11 out of 12 groups got all their problems correct and could explain how to solve them. The twelfth group got 9 of the 10 problems correct. We've also just started Kagan, and the kids LOVE the opportunity to work together in a structured way where EVERYone gets to participate! Thanks for sharing the idea about QR codes for answers... brilliant! My name is Leah Garvens. Like Lindsey posted above, I too, am a student in Dr. Strange's EDM 310 course at the University of South Alabama. As I read your post, I could not help but feel thoroughly inspired. I know that when I was younger, I most likely fell into several of the categories you listed. I was a little bit of a socialite, a wanderer, a loner, etc.. Regardless, I find that your approach to solving this setback was thorough and efficient. Can I say at this point in my early journey to becoming an educator that I could approach such a situation similarly? No, but I'd like to think that I am on the right track. I love the QR code idea. How many times have I watched small children ask for their parents phone or tablet, just to tinker around with it? The answer you can probably agree with since it is fairly common. Today's youth is curious, and the application of the very items they want to play with is genius! Thank you for introducing these wonderful ideas to me! Teamwork makes the dream work! My name is Jerica Gary. I am a student in EDM 310 at the University of South Alabama. I absolutely love this post! The Kagan structure that you use within your classroom sounds like a great idea. I like how it enables you to work with all of your students different personality types. This method also mixes the best of both goals that as a future educator I will do my best to accomplish which is, incorporating technology while keeping students engaged! BrainSMART sounds amazing! Love the blog. Keep it up! Hello Diane, my name is Dominique Jones and I am a student at the University of South Alabama EDM310. I really enjoyed this post. Even though I am not studying elementary education I really found this post to helpful for my subject (Social Studies). I plan to have my students working in groups often and I always wondered how I can make sure all of the students are actually participating. I think your ideas on participation and accountability is great. I also, like your idea on using QR codes. I did not know it was possible to use those. Very interesting!